As a kid growing up, I watched Star Trek in syndication for many years. If it was ever on TV as I was channel surfing, I’d stop to watch. Still do so to this day. 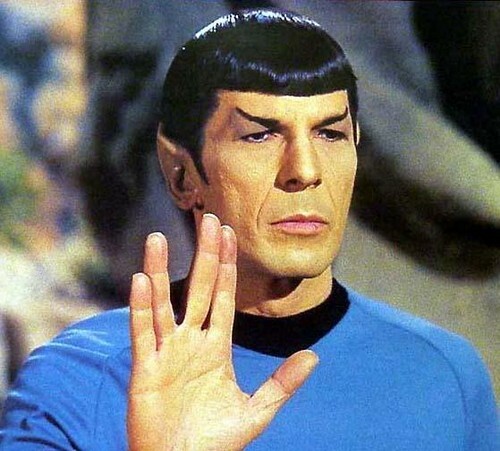 While I am a fan of the series, I have been more of a fan of the character of Spock. He was the rational, logical one with an interesting twist of internal strife to subdue his humanity. Ironically, he was the most human character of them all. He epitomized the struggle of humanity itself trying to reach perfection. Of course, Leonard Nimoy, was an accomplished man beyond the role of Mr. Spock. He directed the popular movie Three Men and Baby, before going back to Star Trek movies, directing two and producing another. He was also an advocate for the arts, doing photography, writing poetry and music. Rest in peace, Leonard. And thank you for creating the iconic character that will live forever in the hearts and minds of us all. This entry was posted in Media and tagged Celebrities by Sonoran Conservative. Bookmark the permalink.